How to know when a nonprofit board has achieved a positive culture? Nonprofit board culture is really about having chemistry that works. Is there transparency and openness? It is an intangible, but it is critical. Is there a spirit of inquiry? That means, for example, that one director can disagree with another director or with the CEO without being hostile or being viewed as hostile for having an opposing opinion. Is the CEO really tapping the creativity of the board? Don’t let board culture mold a new director to an expected narrow framework. For example, don’t have a strong financial manger become entangled with organizational budget details. Instead, use his or her expertise to help develop an intelligent overall financial strategy that can impact the organization’s future. Finally, are there board members who know whether the board is dealing with symptoms or causes? In today’s complex world, nonprofit board needs to be focused on outcomes (e.g., success of specific programs) and the long term “impacts’ of all the programs offered. 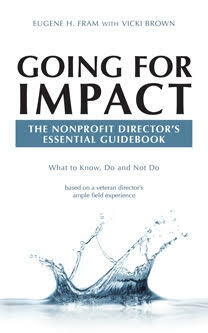 Impact is much harder than outcomes to measure because it is something that is far more ambitious. Nonprofit Directors & CEOs Alert: Never underestimate the power of the established board culture in attempting to make changes. ← Nonprofit Directors & Trustees – Are they adequately personally protected?